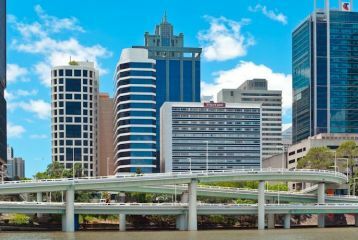 Brisbane is the capital of Queensland, one of Australia's major capital cities and is a popular destination for travellers and conference organisers. Brisbane is regularly described as one of Australia's most liveable cities, it offers visitors a great climate, plenty of sunshine and a vibrant though relaxed experience. While Brisbane is the gateway to the popular beaches of the Gold Coast and Sunshine Coast it is also only a short flight from the Great Barrier Reef, the Queensland Islands, Sydney or Melbourne. Brisbane's Central Business district offers a wide range of hotels and conference venues, available options include small boardrooms for a strategy meeting or a large ballrooms for a national conventions, luxurious hotel or apartment style accommodation, business class executive accommodation or less expensive 'no frills' hotels. Mantra on Queen is a conveniently located and well-priced conference hotel in Brisbane just 20 minutes drive from Brisbane Airport and within walking distance of the city centre. This conference and meeting venue features a conference room that can seat 130 people or can split into 2 smaller sections. Mantra on Queen offers standard hotel-style accommodation as well as 1 and 2 bedroom apartments. The premises offers a restaurant, gym, 24 hour reception and on-site parking. Brisbane offers a great destination for your next meeting or conference. 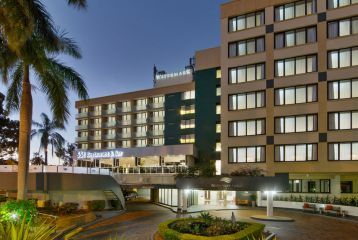 Pacific Hotel Brisbane overlooks Brisbane city centre, offering conference organisers a great value option well suited to smaller groups Pacific Hotel Brisbane is a contemporary 4 star Hotel and Conference Venue just a few blocks from the centre of Brisbane's CBD. 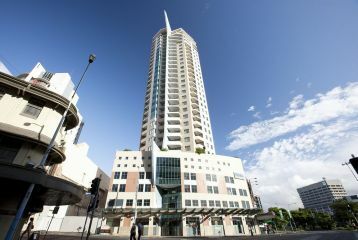 The Hotel is a 10 minute walk through the park to Roma Street Station or a 30 minute walk to the very popular Southbank precinct and its restaurants, cafes and entertainment venues. 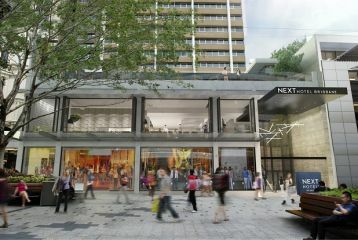 NEXT Hotel Brisbane is a 5 star hotel and conference venue in the centre of Brisbane. 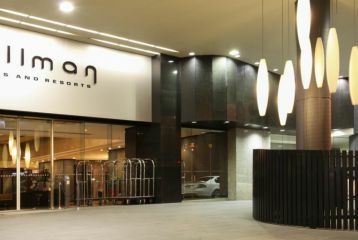 The hotel has been rebranded and tailored to meet the needs of the modern business traveller -- the Business Centre being at its core -- which includes desktops linked to a printer/fax/scanner and supported by purpose-built Executive Studio meeting rooms, smart technology and professional staff. The meeting rooms have collapsible wall panels so you can upsize or downsize easily to create the space you need or you can meet outdoors at the Lennon Pool Terrace & Bar in a more relaxed setting. Hotel Jen is the first of a well-respected International chain of business hotels to open in Australia, offering high-quality accommodation and meeting facilities to conference organisers and business travellers. 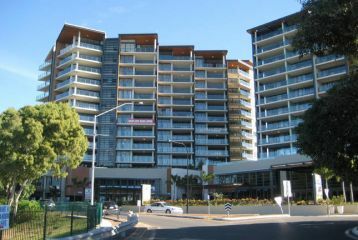 The hotel is adjacent to the Roma Street Station making it easily accessible. Recently, Hotel Jen has undergone a refurbishment of both the hotel rooms and conference spaces. Mantra South Bank in Brisbane is a 4 star apartment hotel that also offers a couple of meeting rooms with natural light, the largest of which can seat 50 delegates. Southbank is a popular part of Brisbane with lots of restaurants and cafes, the hotel is also very close to the new Brisbane Exhibition Centre. Mantra South Bank is a venue that is perfect for small conferences, training programs and executive meetings. The apartment style accommodation offers your delegates more space than a traditional hotel room. 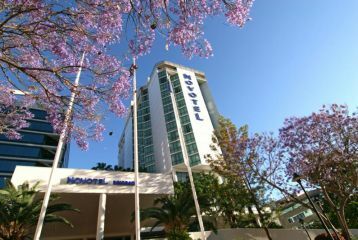 Mercure Brisbane is a 4 star city centre hotel and conference venue in Brisbane which offers great views of the Brisbane River and Southbank Parklands. Mercure Brisbane offers a versatile inner city conference venue well suited to both large conferences and smaller meetings with natural light and spread over 3 floors. If you need a modern business-class hotel and conference venue in Brisbane city centre, Novotel Brisbane could fit the bill. This is a conference venue that offers a variety of meeting rooms, some with natural light, the largest able to seat around 300 delegates. The accommodation is new and spacious with features that will appeal to business travellers and conference delegates. Meeting planners and facilitators will also appreciate the professional experienced staff. 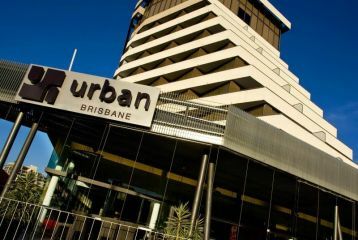 Pullman Brisbane King George Square is a 4 star hotel and conference venue located in the heart of Brisbane's CBD, 20 minutes from Brisbane airport and within walking distance of the financial district and Brisbane Convention and Exhibition Centre. 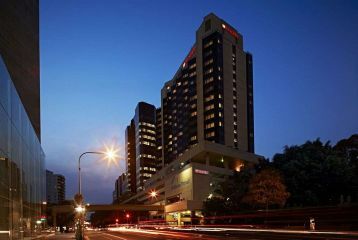 The Hotel is the largest hotel and conference venue in Brisbane, offering a choice of 12 conference rooms the largest able to accommodate 1,000 people and the flexibility to host smaller conferences, meetings and intimate celebrations. 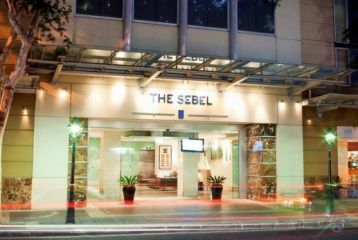 The Sebel Brisbane is a high-quality boutique hotel and conference venue in the centre of Brisbane which offers meeting planners conference rooms that are well suited to smaller groups, executive training programs, workshops and board meetings. The 3 conference rooms are on the same floor and feature free WiFi and natural light. Accommodation at The Sebel Brisbane is stylish and spacious, offering facilities both expected and appreciated by business travellers and conference delegates. 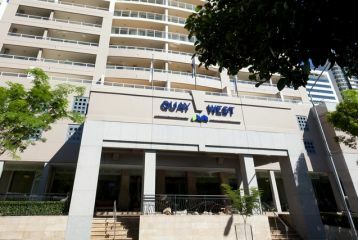 Quay West Suites Brisbane offers 5 star luxury accommodation and hotel facilities coupled with conference facilities that are particularly suited to small to medium sized conferences, sales meetings and training seminars. There's also a great selection of team building opportunities and social activities. This apartment hotel and conference centre is located directly opposite the City’s Botanical Gardens and within walking distance to the Central Business District. 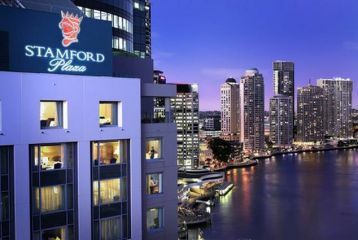 With its elegant furnishings and high quality services, the 5 star Stamford Plaza Brisbane has a distinctive, European-style ambience. The Stamford Plaza Brisbane hotel and conference venue offers meeting planners a prestigious and popular destination with great climate and a wealth of superb dining and entertainment options and a selection of flexible rooms that include a large pillar-less ballroom with natural light, large spaces for exhibitions and smaller meeting rooms. Mon Komo is a new and high quality beachside conference venue in Redcliff just 45 minutes drive from Brisbane CBD. The hotel offers large spacious and new 1 and 2 bedroom apartments, high quality food and beverage outlets, purpose built conference facilities and a selection of onsite recreations facilities. Mon Komo is a conference venue that offers competitive pricing and is also a memorable venue that your delegates will enjoy. 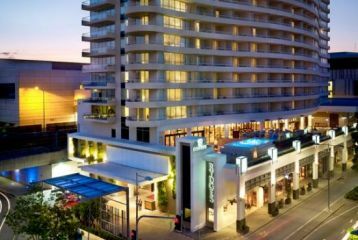 Park Regis North Quay is a good 4 star hotel and conference venue in central Brisbane, just 15 minutes walk from Queen Street Mall or South Bank. This venue offers a selection of meeting rooms the largest of which can seat up to 170 delegates in a Theatre Style setting. 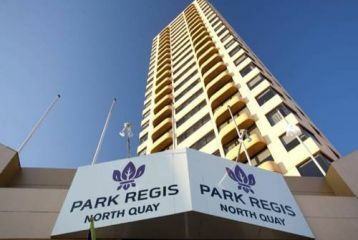 Park Regis North Quay offers your delegates spacious modern hotel rooms and self contained apartment style accommodation. This is a venue that offers great value and reliable mid range meeting facilities. 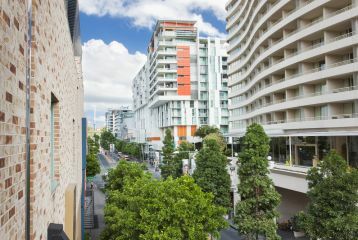 Rydges South Bank Brisbane is ideally located in the heart of Brisbane’s entertainment and arts precinct and boasts a wide range of attractions all around including the South Bank Parklands and the Brisbane Convention & Exhibition Centre. The flexible conference spaces and meeting rooms - many with natural light - can be arranged for virtually any size event and tailored to a configuration that meets your needs. There's the option for Break-Out rooms and the spectacular roof top function space with great views over Brisbane. Copyright © 2019 Queensland Hotel Conferences. All Rights Reserved.